I’ll step through what I ended up doing bit by bit, but the full solution can be found at the end. This is the exact solution I used for my project, but hopefully it is roughly clear which bits to modify to work for your own specific needs. First we define a custom variable MGFXPath that points to my custom compiler and defaults to ‘Dependencies\Utils\2MGFX’. 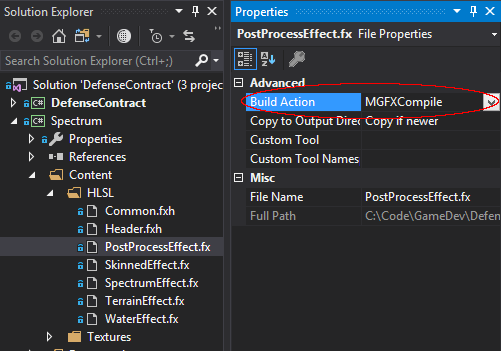 Next we add the custom build action that can be selected on files called MGFXCompile. Then comes two similar sections that define what happen on Build and Rebuild operations. For Build we include an Inputs= section, but in Rebuild we omit it so that MSBuild we perform the target regardless of if the input files have changed. <Exec Condition="%(MGFXCompile.Identity)!=''" Command="$(MGFXPath) %(MGFXCompile.Identity) %(MGFXCompile.RelativeDir)%(MGFXCompile.Filename).mgfx /Profile:DirectX_11"
Next we have a section that marks the resulting output files as “Content”. This is kind of the critical step to getting the output files to be copied around correctly. Then to ensure this content faking target gets run we include this last section. This ensures that before the usual MSBuild AssignTargetPathsDependsOn gets run, the BuildMGFXContent target will also get run to include our new output files as “Content”.